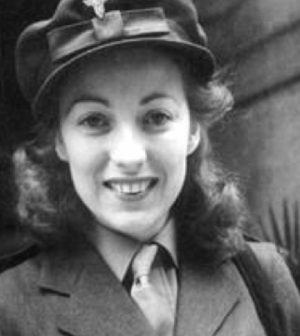 Today is the birthday (1917) of dame Vera Margaret Lynn CH DBE OStJ, widely known as “the Forces’ Sweetheart” because her musical recordings and performances were enormously popular during the Second World War. I almost never honor a living person, but when scouring my lists I found her name and thought she must have passed on by now. Nope. 102 today. During the war she toured Egypt, India, and Burma as part of Entertainments National Service Association (ENSA), giving outdoor concerts for the troops. The songs most associated with her are “We’ll Meet Again”, “The White Cliffs of Dover”, “A Nightingale Sang in Berkeley Square” and “There’ll Always Be an England”. She remained popular after the war, appearing on radio and television in the UK and the US and recording such hits as “Auf Wiederseh’n Sweetheart” and her UK Number one single “My Son, My Son”. 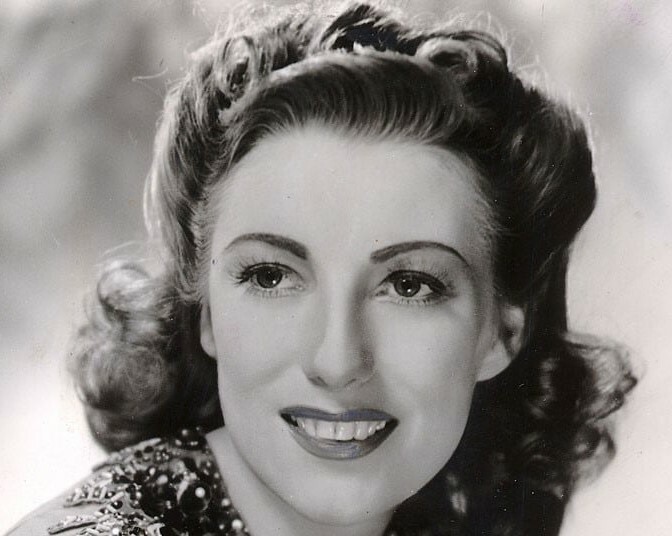 In 2009, at age 92, she became the oldest living artist to top the UK Albums Chart, with compilation album We’ll Meet Again: The Very Best of Vera Lynn. 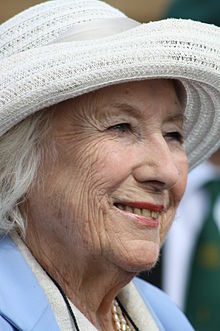 She released the compilation album of hits Vera Lynn 100 in 2017, to commemorate her centennial year, and it was a number-3 hit, making her the first centenarian performer to have an album in the charts. She is held in great affection by veterans of the Second World War to this day, and in 2000 was named the Briton who best exemplified the spirit of the 20th century. Well . . . are we teaching the children??? No need to comment, I know the answer. When looking around for a recipe, I discovered that Vera Lynn’s idea of a simple pleasure is a glass of wine and a bag of crisps. Hmmmm. Not very celebratory, and not something that appeals to me. But, go ahead if it tickles your fancy. Lynn ran into a certain amount of criticism early in her career (pre-war years) because she came from an east London, working-class family. That all faded when she became the forces favorite, and the voice of hope during the Blitz, but she was always proud of her roots. So here’s London Particular, a version of split pea soup developed in the early 20th century in dubious honor of the smogs, known as “pea soupers” that hung over England in those days. 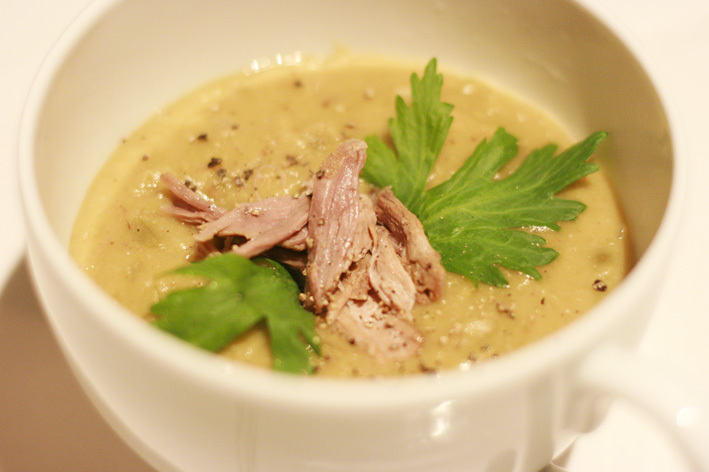 This version requires making ham stock first, and is a little bit different from the usual pea soups in that he contains malt vinegar. Place the ham hock in a large saucepan along with the halved onion, celery, peppercorns, bay leaf, mint, malt vinegar and parsley stalks. Cover with cold water, bring to a boil and simmer, partially covered, for two to two and a half hours, until tender. Leave to cool in the liquid, then remove and strain the stock through a sieve into a bowl. Reserve the stock for making the soup, and shred the meat into bite-sized chunks. Taste the stock: if it is too salty, dilute with fresh water. Melt the butter in a large saucepan over a medium-low heat and sweat the onion until soft and translucent. Add the peas and about 1 ½ liters of stock, bring to a boil, reduce the heat to a simmer and skim off any scum. Simmer until the peas are very soft, between 45 to an hour. Add more stock if the soup gets too thick. Process about three-quarters of the soup in a blender until smooth, adding a little more stock if it is too thick. Season to taste with black pepper. Return to the saucepan with the unblended soup, add some of the ham and warm through. Serve in warmed bowls, with some mint leaves scattered over the top. Place a cruet of malt vinegar on the table in case guests wish to add more.